The matchup is now set in the closely-watched special election for a Tampa-area congressional district: David Jolly, a former lobbyist and aide to the late Rep. Bill Young (R, FL-13), comfortably won the GOP primary on Tuesday over two others. He will face Alex Sink (D), the state’s former chief financial officer and 2010 Democratic nominee for governor. Now that the primary is over, we’re changing the rating in the FL-13 special election from Toss-up to Leans Democratic. Unless national factors become so unfavorable for Democrats that they lift Jolly, we think this race is Sink’s to lose. The special election is March 11. Sink is by far the better-known candidate, owing to her previous time in office and narrow gubernatorial loss, and she has raised much more money than Jolly — according to the most recent campaign finance reports, Sink had more than $1 million cash on hand compared to Jolly’s $140,000, which presumably was used at least in part to win the primary. Democrats also preferred to face Jolly in this race because of his past work as a lobbyist. Part of our ratings change here is based on the incentives for this special: Democrats really need to win this seat if they have any hope of regaining a House majority. It’s a politically marginal seat that President Obama won 50% to 49% over Mitt Romney in 2012, and it’s the kind of seat upon which a future Democratic House majority would be built as Democrats lose their remaining conservative redoubts in the South and Appalachia. National Republicans, on the other hand, have a 17-seat edge in the House, and they recognize that their best candidates in this district took a pass. Republicans also privately admit that their record in special elections is not all that great. While they did score an upset in a New York City special election last cycle — Anthony Weiner’s old seat, which was then eliminated in New York’s redistricting plan — Democrats have generally gotten the better of Republicans in recent competitive specials. National Republicans, we believe, are going to be cautious in how they approach this seat. They’ll pounce if they see a path to victory, but they don’t need this the way the Democrats do. It’s possible that we’re overestimating Democratic chances here. Sink, after all, is not the world’s best campaigner, as Adam Smith of the Tampa Bay Times helpfully reminds us. And the national climate could play a role, too, and tip this race in Jolly’s favor. We’ll be watching closely. But at this point, Sink seems like a pretty clear favorite, and we felt it was reasonable to change our rating to reflect that. Finally, we need to offer our obligatory caution about special elections: They are not predictive of future general elections. You’ll see a lot of huff-and-puff political rhetoric if Sink wins the seat, but all that would really say is that Democrats would have to pick up 16 net seats rather than 17 to take over the House in November. And we continue to think that a Democratic House takeover is highly unlikely. In the past few days, four more House members — three Democrats and one Republican — announced their retirements. Two of these members, Reps. Jim Moran (D, VA-8) and George Miller (D, CA-11), represent similarly safe Democratic seats (68% Obama). But the other two retirements should affect the competitiveness of their seats. Retiring Rep. Bill Owens (D, NY-21), whose seat covers most of New York’s North Country, became the first Democrat to represent the area in the House since 1852 when he won a 2009 special election thanks in part to a split in the Republican Party. Owens won two more close elections in 2010 and 2012, and he ran behind Obama by a couple points in 2012 (Obama got 52% here). As both parties sort out their fields, we’re moving this race to a Toss-up. On the other side of the country, the apparent retirement of Rep. Buck McKeon (R, CA-25) — reported late Wednesday by Politico — comes as no surprise. The legendary military appropriator has been a rumored retiree for months, to the point where two credible Republicans — former state Sen. Tony Strickland and state Sen. Steve Knight — had already announced their interest in running for the seat. Expect a tough battle between the two, and maybe others, to determine who advances from California’s jungle primary to reach the top-two battle in the general election. Strickland ran a credible but losing race against Rep. Julia Brownley (D, CA-26) in 2012. On the Democratic side, podiatrist Lee Rogers, who held McKeon to a somewhat unexpectedly close 55%-45% victory last cycle, is also running again. Now that the seat is open, we’re moving it from Likely Republican to Leans Republican. The district tilts Republican, but not by a ton — Romney won it 50%-48% in 2012. So far this cycle, there have been 16 House retirements, according to Roll Call’s congressional casualty list. Over the 10 previous cycles, 21.5 members on average have retired. So chances are, we’ll see more retirements. That does not include members who are vacating their seats to run for higher office or who have resigned or died in office. Using this broader definition, there are 31 seats that will feature open seat races this year, starting with the aforementioned special election in FL-13 in March. Those seats are listed in Table 2. 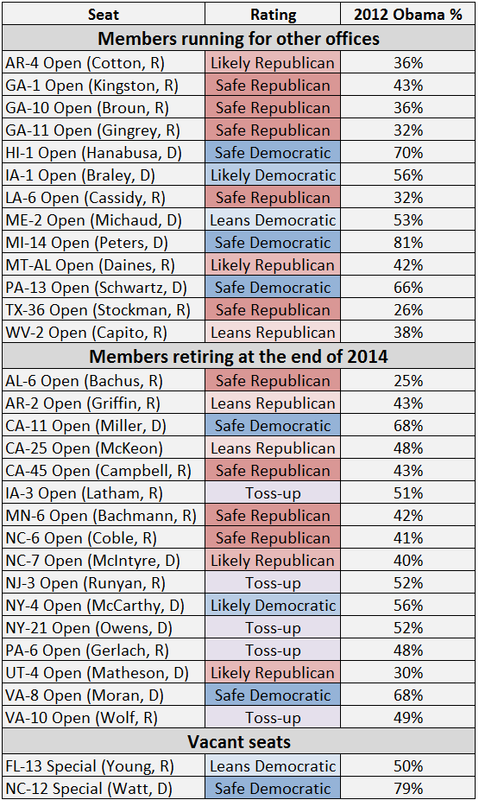 In assessing the race for the statehouses, there are three Republican incumbents who stand out as particularly vulnerable. Two of them, Govs. Tom Corbett (R-PA) and Paul LePage (R-ME), are actually listed as underdogs in our ratings owing to their unpopularity in states that are, at the presidential level, at least slightly more Democratic than the nation as a whole. A third, Gov. Rick Scott (R-FL), sports poor approval ratings and is locked in a Toss-up duel with party-switching former Gov. Charlie Crist (D). Until now, we had a fourth Republican incumbent listed in that very vulnerable group: Gov. Rick Snyder (R-MI). Snyder took a beating at the end of 2012 when the state passed controversial right-to-work legislation in a legislative lame duck session, and his poll numbers dipped. But at this point we’ve seen Snyder stabilize, and we think it’s more accurate to reinstall him as a favorite. As such, we’re moving this race from Toss-up to Leans Republican. Snyder is probably still a bit more vulnerable than other Midwestern governors seeking second terms, like Govs. John Kasich (R-OH) and Scott Walker (R-WI). Ex-Rep. Mark Schauer (D), Snyder’s presumptive November opponent, should run a credible race. But Snyder doesn’t have the kind of obvious liabilities of a Corbett, LePage or Scott. At this point it appears that the open seat Michigan Senate contest between Rep. Gary Peters (D) and ex-Michigan Secretary of State Terri Lynn Land (R) should be more competitive than the state’s gubernatorial race, although we continue to hold the rating in that race at Leans Democratic.